Citroën Protect provides a series of products that will preserve and cherish the showroom fresh feel for a guaranteed 3 or 5 years. Everything is applied by our professional technicians, so all you have to do is collect your car from your Citroën Dealer, knowing it will keep its stunning looks with just a quick wash and wipe. 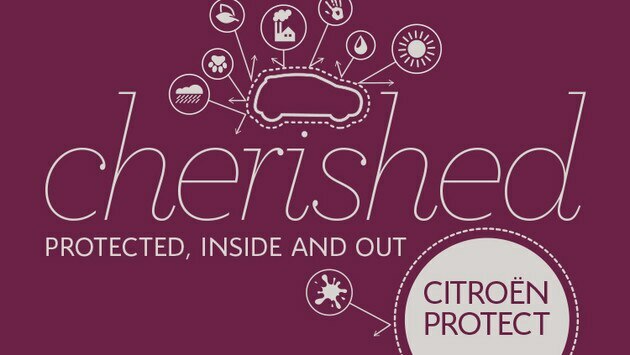 Your Citroën leaves the showroom with a deep shine to its paintwork and a spotless interior. So why shouldn’t it stay that way for the future? Everything is applied by our professional technicians, so all you have to do is collect your car from your local Citroën Dealer, knowing it will keep its stunning looks with just a quick wash and wipe. Is an optional clean and protect solution that looks after the luxury feel and longevity of your leather interior. Covers every single fibre of upholstery fabric and carpet with a sophisticated formula that makes removing stains really easy and preserves the as good as new look and feel. Is an invisible high-tech microfilm that bonds with your precious paint finish to form a durable high-gloss barrier, defending it from the elements, pollution, tree sap and more.